It only takes a moment to make a report online. Like other criminals, terrorists need to plan. They need to prepare, buy and store materials, and find ways to fund their activities. Much of this is done in view of the public. For further information view our FAQs. Report any of the below activity if you believe it to be suspicious or cause threat. Do you know someone who travels but is vague about where they are going? Do you know someone with multiple passports in different names? Do you know someone who looks at extremist material? Or shares or creates content that glorifies terrorism? Have you noticed somebody promoting hateful ideas or extremist views? Have you noticed someone receiving deliveries for unusual items? Have you noticed someone buying large amounts of chemicals or gas cylinders for no reason? Have noticed someone acquiring illegal firearms? Have you noticed anyone storing large amounts of chemicals, fertilisers, or gas cylinders for no reason? Have you noticed anyone storing firearms which could be used for an attack? Observation and surveillance help terrorists plan attacks. Have you noticed anyone taking photos and observing CCTV or security arrangements? Cheque and credit card fraud are ways of generating cash. Have you noticed any unusual bank transactions? If you see online graphic or violent extremist material or content that supports, directs or glorifies terrorism please report it using our anonymous online reporting form. Terrorists use the internet to provoke individuals to carry out attacks in the UK. One post or video has the power to influence vulnerable people and inspire extremists and terrorists. This is why it is important to tackle online terrorism. A specialist police team will examine the content and will work with internet companies to remove it if appropriate. When you make a report about suspicious activity or behaviour, our specially trained officers and police staff will take the details and pass these on for further checks. The information you provide will be kept secure and your identity will be protected. Your call is not recorded and you do not need to give your name. Don’t be concerned about wasting police time. Find out more information on the Counter Terrorism Police website. ACT Awareness e-Learning is a new counter terrorism awareness product designed for all UK based companies and organisations. Organisations wanting more information, or to apply for registration, should visit the National Counter Terrorism Security Office website’s ACT Awareness page. If you are caught up in an incident our advice is to ‘Run, Hide and Tell’ – guidance which can be applied to many places and situations. 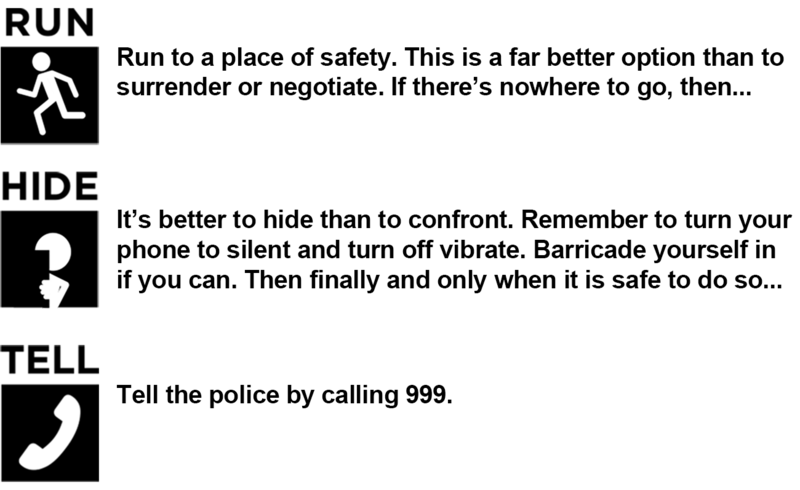 We know from case studies and testimony of people who have survived attacks that this advice can save lives. Find out more on the Counter Terrorism Policing website about how to stay safe and how both the public and industry can help report suspicious activity.